Agence Metropolitaine de Transport, better known as Metropolitan Transport Agency is an umbrella organization tasked with planning, integrating and coordinating public transportation services across the Greater Montreal region in Canada that also includes the Laval and Montreal islands. It was established in the month of December in the year 1995 and took over commuter rail operations the very next year. At present, AMT is in full command of operations for the bus and Metro services in the Montreal region of Canada. The vision of this agency is to make getting around easier and improve the quality of life of the people of the Greater Montreal region. It serves nearly 19 million passengers annually and in 2014, ranked first with a punctuality rate of 96.6% in commuter rail service of North America. AMT receives its highest profile division from the operation of its commuter rail service. There are two types of train service running along two different routes: Electric Multiple Unit trains on the Deux-Montagnes Line and Diesel-Electric Push-Pull services along all other routes. Electrification work was carried out on the Deux-Montagnes Line owing to the existence of the tunnel connecting Central Station was poorly ventilated. Restrictions had initially been imposed on the operations of diesel services through the place, today it is totally prohibited. Map of Agence Metropolitaine de Transport showing its lines and stations. Click on the map to enlarge it. The ATM commuter rail service or Metro operates along six different tracks. The Saint-Jerome Line, is the longest of the lot at about 62.8km long. While at 25.6 km long the Candiac Line is the shortest of the lot. 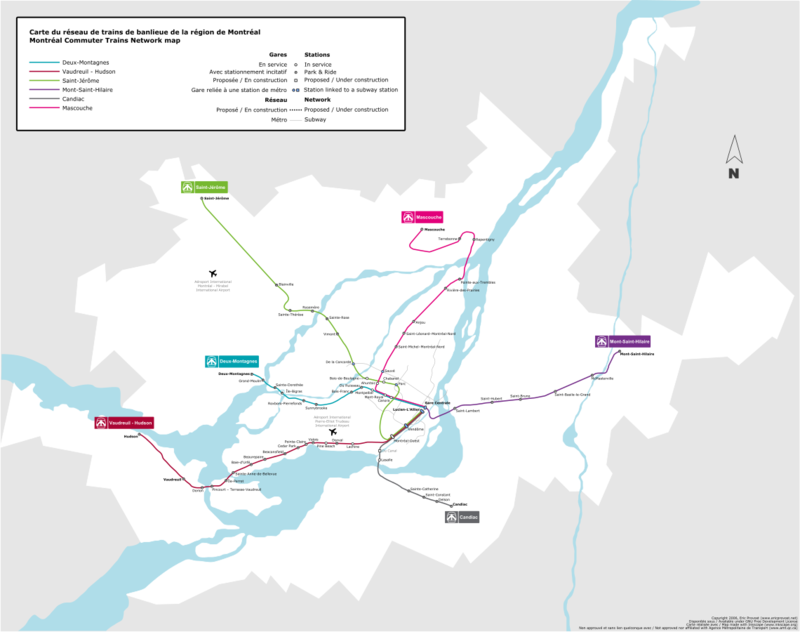 The other four lines being: Deux-Montagnes Line, Vaudreuil-Hudson Line, Mont-Saint-Hilaire Line and the latest addition, the Mascouche Line. All of these services are integrated with the Metro and bus services operated by the Societe de Transport de Montreal (STM). The fare system for the Agence Metropolitaine de Transport varies according to the zones. The Greater Montreal Region is divided into 8 fare zones.Children of the ages of 5 and below as well as children between the ages of 6-11 who are accompanied by adults, travel on the commuter train for free. The Agence Metropolitaine de Transport service starts operations at 6:00 in the morning and is in operation till 17:00 in the evening. The Agence Metropolitaine de Transport has 6 lines of commuter trains, each following a different schedule.